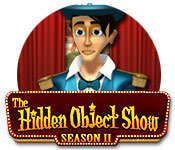 The Hidden Object Show: Season 2 is rated 3.1 out of 5 by 9. Rated 5 out of 5 by Lioness901 from A great improvement on season one Everything is better in this season. I love the carnival theme it makes it much more fun. I love the different attractions. I love that I'm able to win tickets to win prizes like at a real carnival. I love hearing the reactions of the audience as I play. My only complaints are I wish there was a way to turn off the timer I was would love to play untimed versions of the different hidden object scenes and there needs to be more prizes to win as I've won them all and I'm not at the end yet. Other then those things I would recommend this for a whole family to play. There's nothing creepy or scary in it it's all lighthearted relaxing fun. Rated 4 out of 5 by Mojo_Bone from Worth it I enjoy HOGs and this one is one of the more fun. It is nice to play an HOG that doesn't revolve around crime. Everything in this game is tongue and cheek. I play it when I want to relax and sharpen my observatory skills. I really don't care that there is not a plot in this game. Not every game needs a plot or a backstory. Rated 4 out of 5 by arnold1049 from VARIATIONS ON A THEME This game is very, very long. It will take you days and days to complete. There are 300 rounds in this game. There is no story line, just HOS in many variations. In fact, there are between 15-20 types of HOS, ranging from "Find and Replace" to a type of Hangman's game. Although the scenes repeat themselves throughout the game, they are challenging enough not to get too boring. If you just want to hone your HO skills, then this is the game for you. 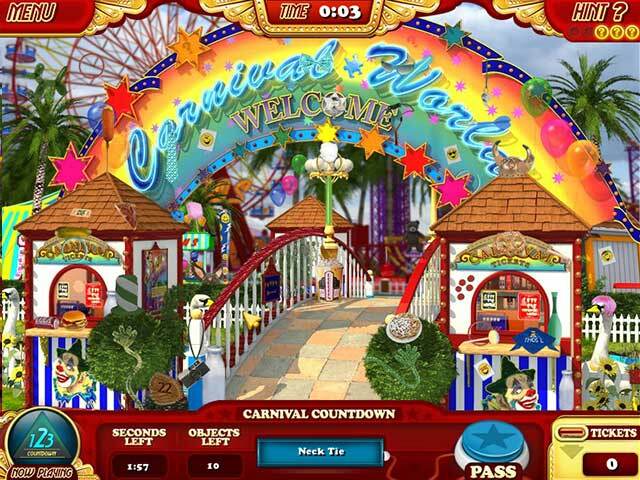 Rated 3 out of 5 by alsteele28 from Carnival based HO game This season is set in a carnival and whilst similar to the first season in that you are in a gameshow, I found this more interactive and better layout. There was also different mini-games (such as a hangman style), in addition to the ones of the first season. This time instead of spinning a wheel to decide your next game you have a 'fortune teller' who 'strokes' the crystal ball'. Again there are skip chips if you don't want/like a particular game. Whilst the first game was a 'list' game after that it was more random than the first series as to what to what game you played. You unlocked as you went, giving you incentive to carry-on to see what other games they were that you can unlock. 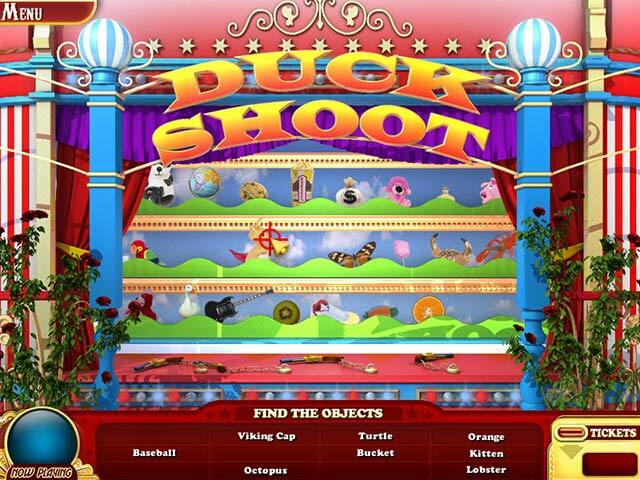 In addition this 'season' had mini-carnival games that you could play in order to purchase 'tickets' to spend in the shop in order to gain game items. I would say that the second season is no worse or better than season one, and if you are thinking of purchasing as a stand-alone, I personally wouldn't as you can purchase the combo-pack for the same price, and with this you get both season one and season two (but obviously not the third installment). Rated 2 out of 5 by bkuper from Really disliked it This game is terrible. One of the first things I noticed were the spelling mistakes. Not in every place, but enough to catch one's eye and make a player feel like this game had been rushed through quality control. Also, the game just never seems to end - literally. I've put in about 20 hours and have only progressed about 40%. Eventually I just stopped playing because I was seeing the same screens over and over and over and over. Maybe it's a glitch, I don't know. What I do know it that I just got too bored to bother continuing. Rated 1 out of 5 by nufsober from EXTEMELY BAD! AND NOT IN A GOOD WAY!!!!!! I HAVE TRIED MAKING IT THROUGH THE HOUR FREE, FORGET IT! LIKE SOMEONE ELSE SAID, THE HINT THING, IF YOUR EYESIGHT IS NOT PERFECT, FORGET FINDING THE ITEM THAT THE HINT POINTS TO!! THE GRAPHICS WERE THE BEST!! THAT VOICE, I COULDN'T STAND IT IN THE FIRST ONE, AND NOW HE'S BACK TO BORE US AGAIN WITH HIS SAME SARCASTIC SAYINGS!! FORGET THIS ONE AND MOVE ON TO SOMETHING WORTH YOUR TIME! I DELETED IT AFTER 15 MINUTES !!!!!!!! Rated 1 out of 5 by catbag8717 from Completely Hated It Really hated this game. Could only just bear 10 minutes. Good Parts: The only good thing about this game would have to be the graphics. I really liked these and thought they were very detailed. OK Parts: There should have been some sort of storyline in my opinnion. Bad Parts: The objects were very hard to find. The hint would not help at all. Something would point to the object instead of having a circle go around it, which meant if you weren't paying atention, or have poor eyesight, you'd miss it. The shillouette thing. I really did not like this at all. The game was so boring. There should've been some stuff added to it to make it more interesting. Limited number of hnts really annoyed me, because as I stated before, the hint would not help at all, so sometimes I'd have to use 3 hints on an object. I don't think I've ever hated a game as much as this. I cannot and will not recommend it. Play something else. 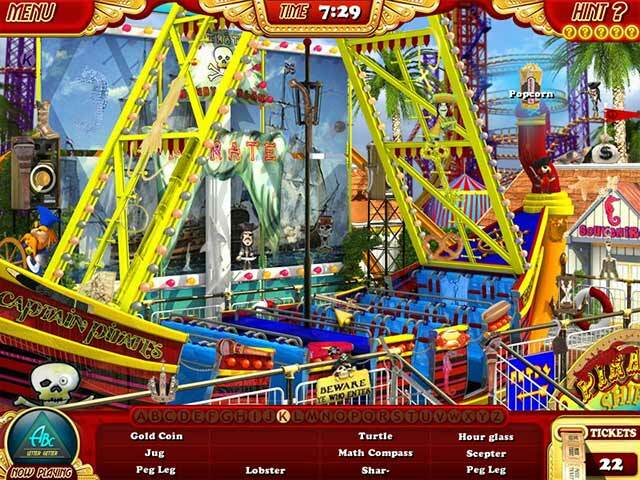 In this great sequel you must test your skills of observation in this dizzying whirlwind tour of a wacky amusement park.